272 pages | 50 B/W Illus. In this volume, twenty-four creators come together with three scholars to discuss Contemporary Circus, bridging the divide between practice and theory. Lavers, Leroux, and Burtt offer conversations across four key themes: Apparatus, Politics, Performers, and New Work. Extensively illustrated with fifty photos of Contemporary Circus productions, and extensively annotated, Contemporary Circus thematically groups and contextualises extracts of conversations to provide a sophisticated and wide-ranging study supported by critical theory. 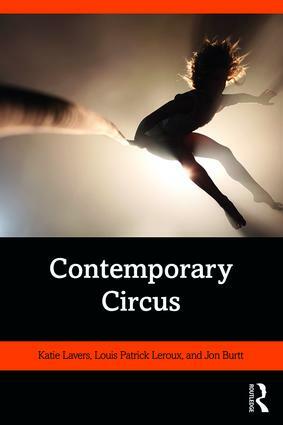 Of interest to both practitioners and scholars, Contemporary Circus uses the lens of ‘contestation’ or calling things into question to provide a portal into ways of seeing today’s circus performance. Katie Lavers is an Adjunct Senior Lecturer at the Western Australian Academy of Performing Arts, Edith Cowan University, Western Australia. Her research interests are Circus Studies, Performance Studies, Animal Studies and Eco-Feminism. She is the Co-Editor of The Routledge Circus Studies Reader (2016). Louis Patrick Leroux is a Professor and Associate Dean of Research, Faculty of Arts and Science at Concordia University, Montreal. He is the Director of the Montreal Working Group on Circus Research and Co-Editor of Cirque Global: Québec’s Expanding Circus Boundaries (2016). Jon Burtt is a Lecturer in the Department of Media, Music, Communication and Cultural Studies at Macquarie University in Sydney, Australia. He teaches across dance, theatre, and circus. His research interests are Contemporary Circus Practice and Training; and Circus for Social Change. He is the Associate Editor of The Routledge Circus Studies Reader (2016).